For menopausal women, progesterone can be a difficult hormone to understand. Because it exists in a delicate balance with estrogen, it can cause several problems when your hormones go haywire. Many times, women face lower levels of all hormones, including estrogen, progesterone, and testosterone. But what happens when levels of this hormone become too high? Keep reading to find out how to recognize high progesterone levels and how to treat them. What Causes High Progesterone Levels? Naturally, women should experience increased levels of progesterone during ovulation and pregnancy. However, when many middle aged women reach menopause, their reproductive years are part of the past. During menopause, high progesterone levels are usually the result of a hormonal imbalance. This occurs when there is a drastic drop in estrogen production, causing progesterone dominance. High progesterone levels can also be the result of sedentary life and an imbalanced diet. What Are the Symptoms of High Progesterone? Increased progesterone levels often have signs and symptoms such as muscle fatigue, drowsiness, and mood swings. In addition, this condition can affect your sexual health by causing vaginal dryness and loss of libido. Emotionally, you may be more prone to anxiety and depression. Other less common symptoms of high progesterone can affect your physical appearance. In excessive amounts, this hormone can cause oily skin, acne, and weight gain. It can also affect your excretory system, causing urinary tract infections and incontinence. How Can I Treat Progesterone Imbalance? 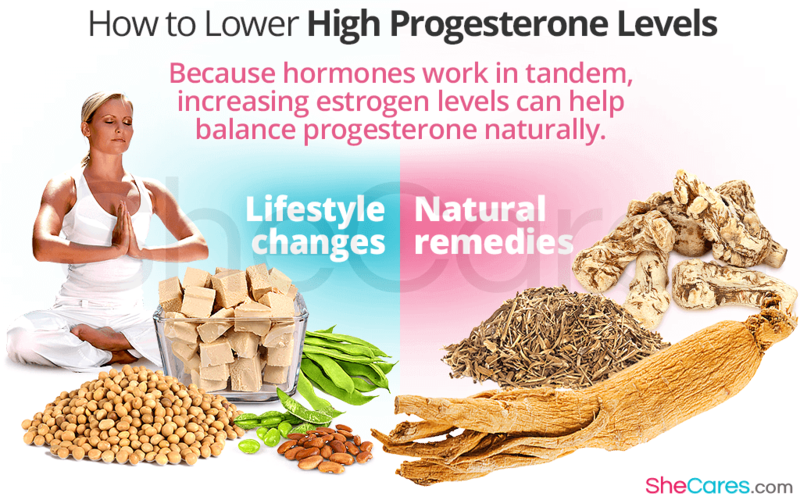 There are dietary and lifestyle changes you can make to lessen the uncomfortable effects of high progesterone levels. One recommended treatment is to increase estrogen levels naturally. Because these two hormones work in tandem, an increase in estrogen levels will naturally lower progesterone levels. If these changes don't solve your hormonal imbalance, there are also natural remedies like dong quai, ginseng, or black cohosh that you can take to support your body's own hormones. No matter which natural approach you take, it's always a good idea to talk to your doctor before beginning a new regimen. Exercising to reduce stress can also lessen the effects of hormonal imbalance during the unpleasant stage of menopause. Activities such as yoga, meditation, and tai chi can have a positive impact on your lifestyle. Click on the following link to learn more about treating progesterone imbalances. How Do I Know If I Have High Levels of Progesterone?